Sebby Holmes's adventurous approach has made his London pop-ups a huge success. In Cook Thai, he features the dishes that have seen crowds queuing round the block, perfectly adapted to suit the home cook. For Sebby, Thai food is not a special occasion cuisine, it's a delicious, varied and exciting style of food that can be eaten every day. His recipes use ingredients that can be easily be found in supermarkets, and include essential pastes, dips and pickles that can then be used as a starting point to explore this fragrant cuisine, as well as small bites such as Tiger Prawn and Sweet Potato Fritters, stir-fries such as Sticky Pork Belly with Salted Roast Pumpkin and impressive sharing dishes such as Grilled Whole Seabass with Coconut Chilli Jam. 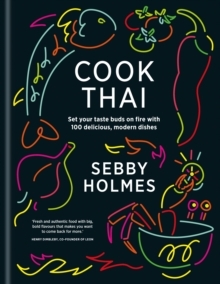 A genuinely modern cookery book providing a refreshing, eclectic mix of southeast Asian dishes.